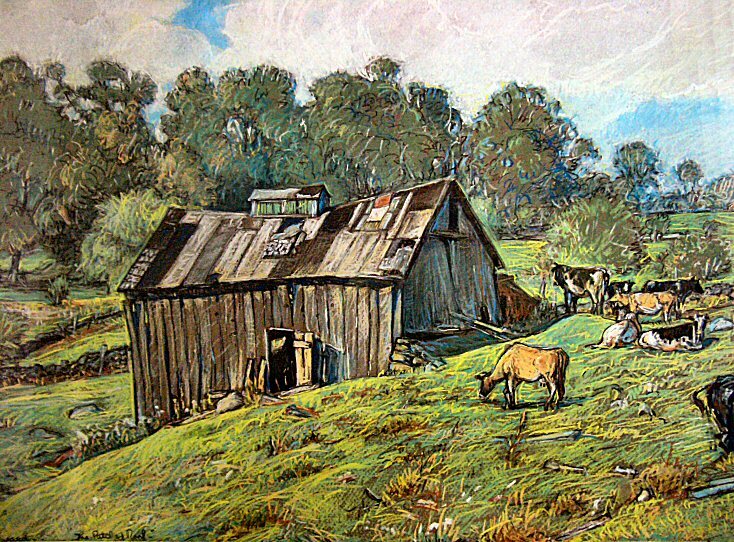 RSW- Artwork page, "The Silver Barn"
The original was supposedly destroyed but may still exist. 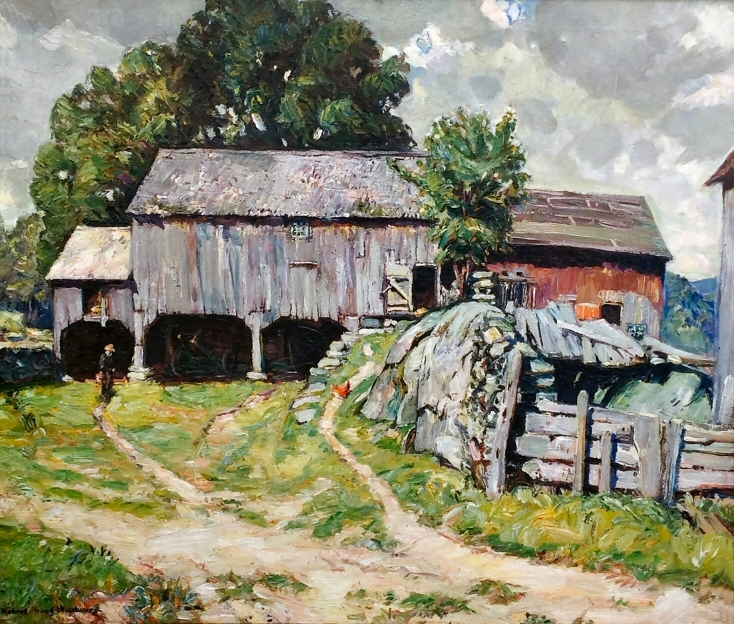 See also the... Barns Gallery to view related pieces. See also the Scrapbook page devoted to Mrs. Everett. See also the... People & Livestock Gallery for related pieces. See also Farmland Ledge to view related piece. See also the... Fences, Gates & Doors Gallery to view related pieces. See also the Sketch Book Gallery to view related pieces. See also the... Farms Gallery to view related pieces. See also the... Rocks & Stone Walls Gallery to view related pieces. you can enlarge the image simply by clicking on it. 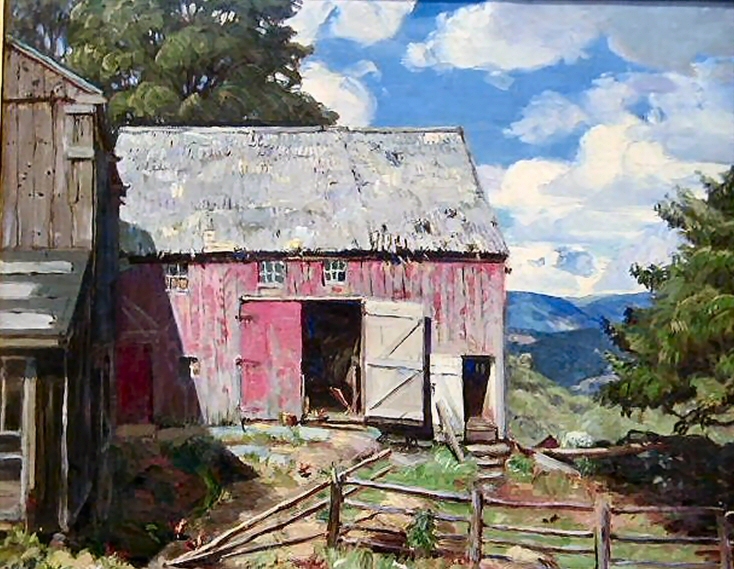 "Painted in 1945. A painting made in the studio for my G.C.A.G. Exhibition in New York in the spring of 1945. Made from an earlier 25 x 30 which was not perfect technically and which I destroyed after copying it, as above, made in West Hawley of a picturesque old barn set over ledges, the farm of Mr. Stetson. 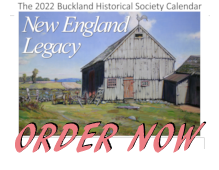 Figure of old man with pail in the barn yard, and figure of (smaller) man watering old white horse at watering trough." 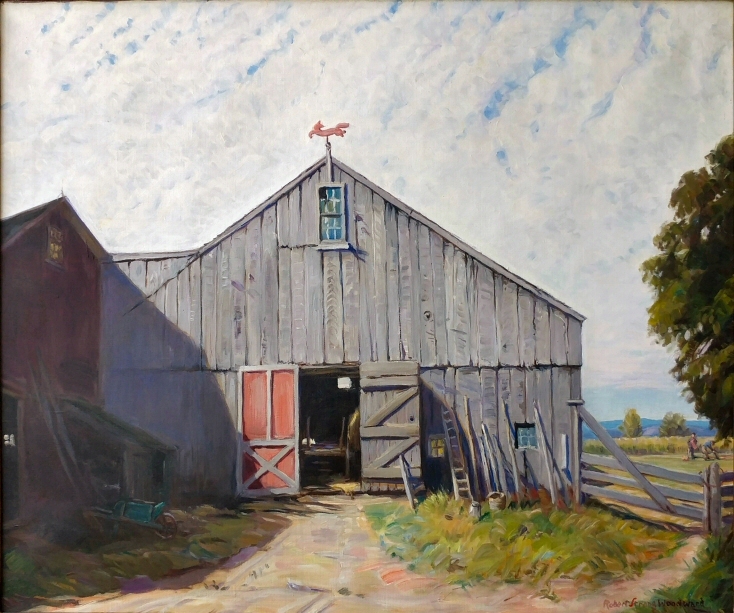 "Main barn silver, sunlit gray. 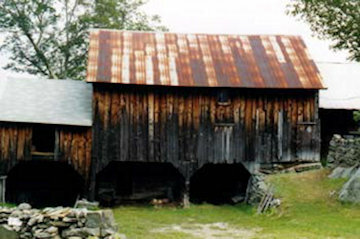 Barn ell weathered brown. Small tree turned dull red; big mass of maples over barn still dark green. Stone ledges and fence, pale grayish-green. Grass and paths of foreground quite neutral in green and pink. Violet-gray clouds with some pale blue patches of sky." The barn is still standing. Here is a 2001 photo. 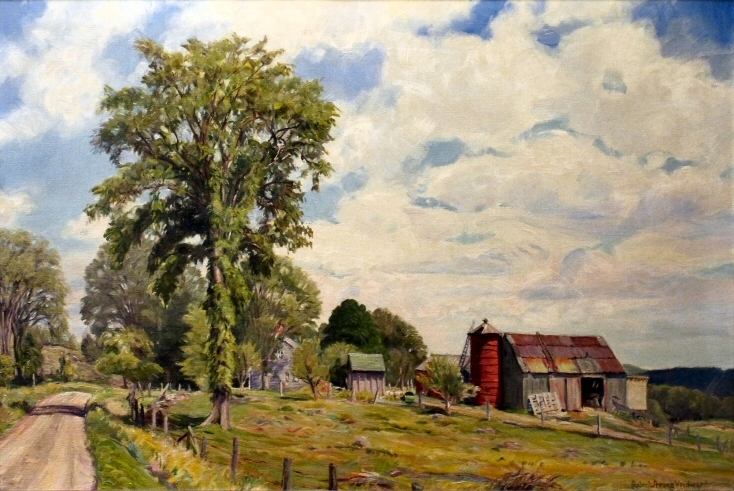 Between 1938 and 1945, RSW "re-painted" a number of paintings he held on to because he liked the subject but found them to not suit his standard. 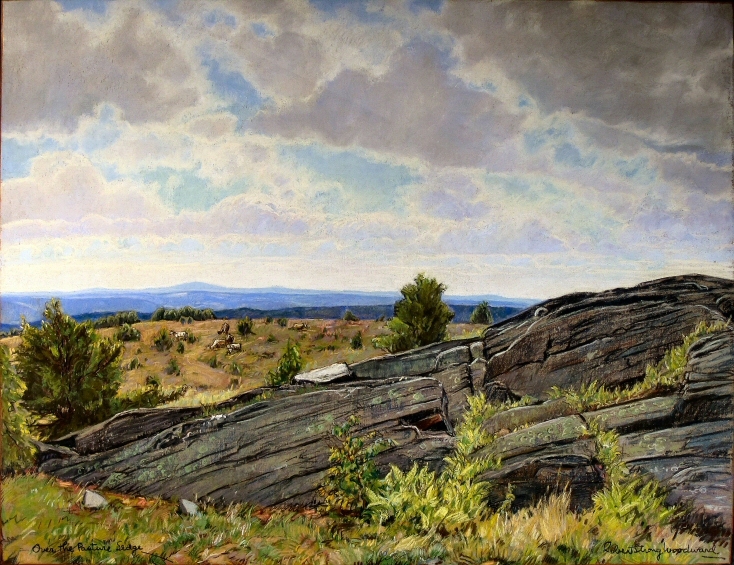 While Farmland Ledge is a painting in its own right, we believe there was a third painting which was repainted to make this painting and the original, unsuitable painting was then destroyed. 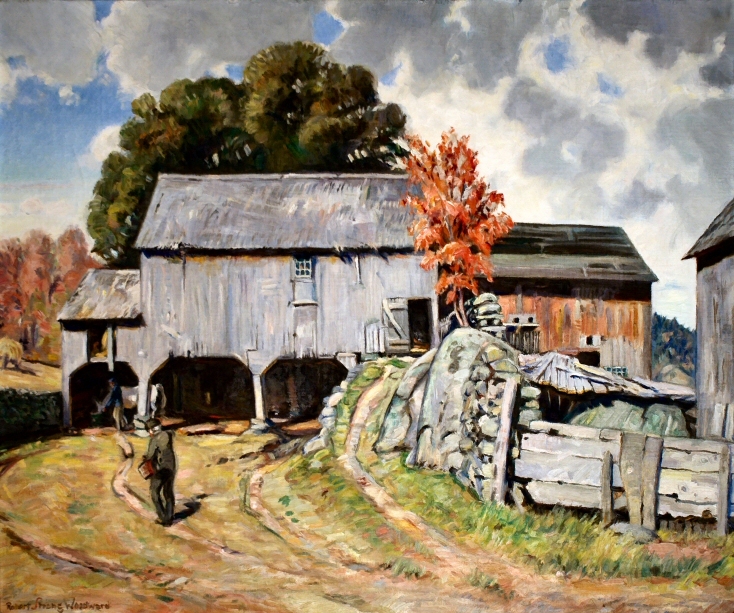 It is very subtle but there are distinct differences in style between this painting and Farmland Ledge. It tells us that Farmland Ledge was painted earlier, probably around the time of the destroyed painting, and possibly as much as a decade, maybe more, between the two paintings. 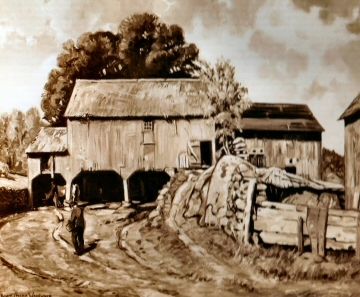 A sketch of the back side of the Stetson barn. On the back stretcher of The Silver Barn there is a sketch drawing of the backside of the barn found in our Sketchbook Gallery and can be seen to the picture to the left. Also, recently discovered in an old shipping crate in the attic of the Southwick Studio, is an unfinished chalk of the farm itself. 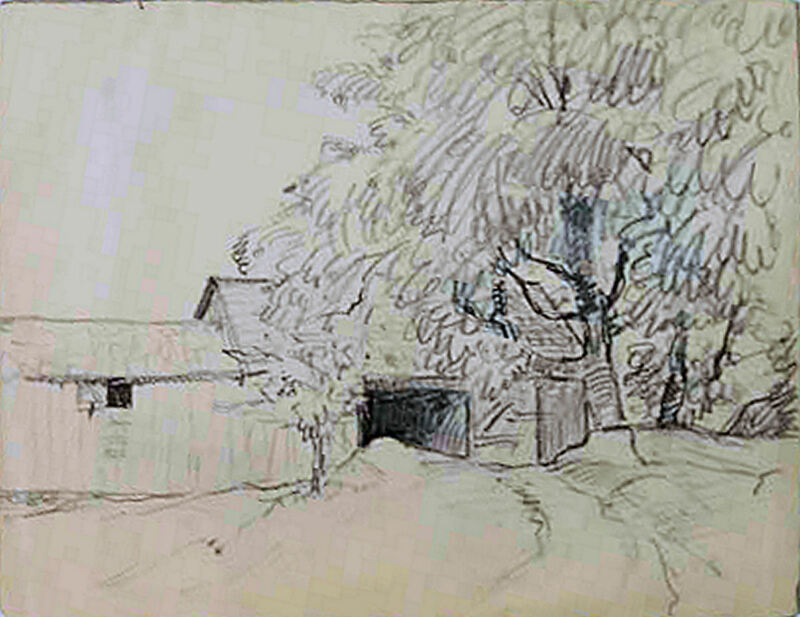 It is more sketch than chalk, but RSW did begin to apply his white chalk which seems to be the color he started with. The drawing shows the layout of the barns in relation to the sheds and farmhouse. 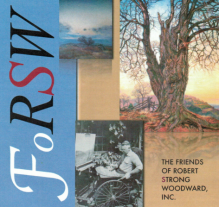 We do not know why RSW did not complete this piece and are very disappointed to not get to see we he would have done with the subject. 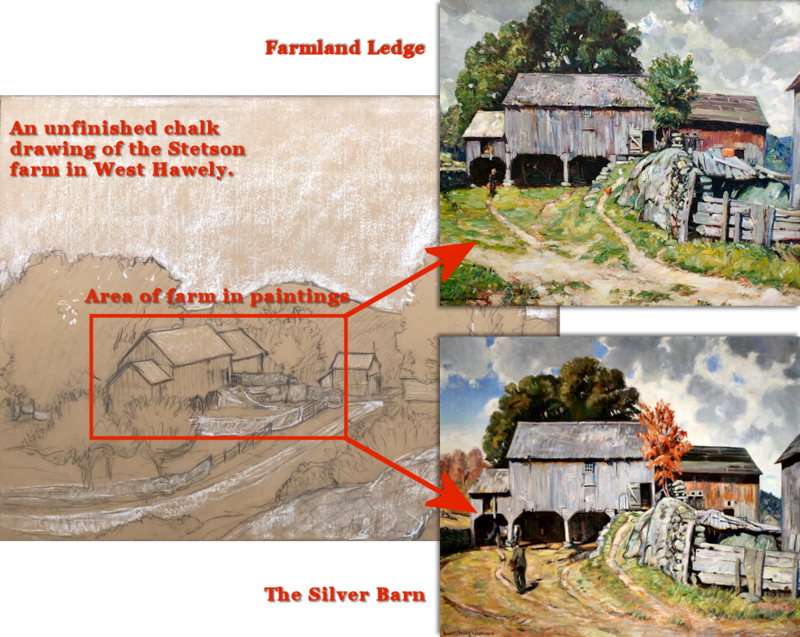 Below, we have prepared a graphic showing the subject area of Farmland Ledge and The Silver Barn.